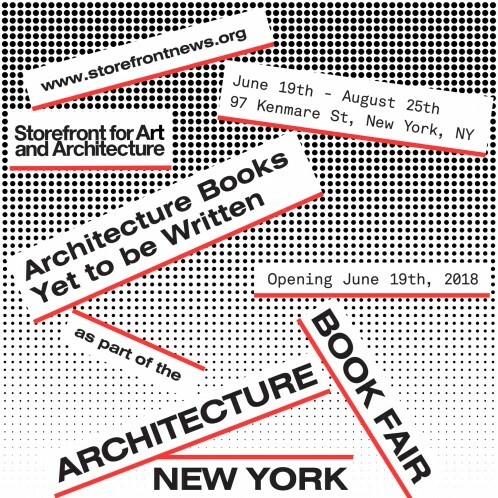 As part of the first edition of the New York Architecture Book Fair, Storefront for Art and Architecture presents Architecture Books – Yet to be Written, an exhibition that invites us to reflect upon the cultural contribution of architecture through the medium of the book from 1982 to today. With an archeological and projective twist, the installation seeks to celebrate and evaluate both the existing and the missing volumes of a history still in the writing. Storefront was founded in 1982 as an alternative platform for discourse and debate that brings important issues to the forefront, and that extends beyond ideological and disciplinary boundaries. 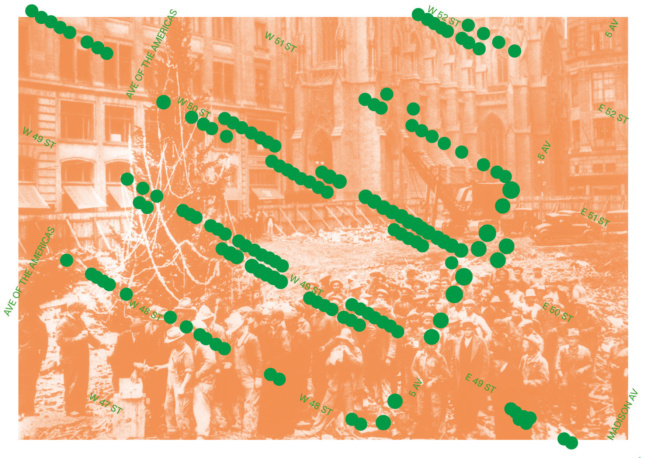 The period of exploration for the first edition of the New York Architecture Book Fair coincides with this recent history, taking the last 35 years as the starting point for a discussion about our contemporaneity. The series of programs organized as part of the book fair produce a forum for discussion and debate about the books that allow us to understand architectural discourse in a wider cultural, social, and geographical context. The project focuses on the ways in which architects, as well as urban planners, landscape architects, and all professions and people who engage in the making of places and spaces, contribute to our understanding of the built environment. Questioning the idea of the canon, this project seeks to broaden the existing references for architecture culture, which have served to homogenize architectural discourse. With the purpose of opening up the conversation to new ideas, Storefront launched a Global Survey of Architecture Books that reached more than 1600 scholars, critics, museum directors, historians, and others from 98 countries, asking them to contribute nominations of books from the past 35 years that are fundamental to the development of ideas and culture in architecture. A selection of the nominated books, with brief statements that contextualize their relevance, are presented in the installation as the structural support for a series of bookshelves that will be populated by additional publications throughout the duration of the exhibition. The bookshelves are affixed to the rotating facade panels, designed by Vito Acconci and Steven Holl, that connect the street to the inside of Storefront’s gallery space. Mostly empty to start, the shelves will densify over the course of the exhibition with a growing selection of nominated books submitted by invited groups, including non-profit organizations, students, independent publishers, creative collectives, and gallery visitors. Ultimately, however, the space will remain relatively sparse in relation to the monolithic shelves, reminding us that many of the crucial books are yet to be written. A series of visualizations upon the walls of the gallery space present the scope of the project and prompt visitors to actively suggest, think about, and reflect upon the contemporary context of architectural publications. The exhibition, along with the first edition of the New York Architecture Book Fair, provokes us to reimagine our personal collections, the existing infrastructures of cultural production and dissemination, and the algorithms that recommend our next reading material. Alongside nominated books, the installation presents a digital repository of book covers and titles for retroactive manuscripts and projective volumes – books that we should have written, but that we never did, and books yet to be written, that we still should. This growing collection was first presented at the launching conference of the book fair, Architecture Books / Yet to be Written, in the fall of 2017 at Cooper Union’s Great Hall. The repository includes contributions by: Diana Agrest, Stan Allen, Amale Andraos, Henry Cobb, Beatriz Colomina, Reinier de Graaf, Peggy Deamer, Elizabeth Diller, Kenneth Frampton, Sanford Kwinter, Daniel Libeskind, Thom Mayne, Richard Meier, Ana Miljacki, Enrique Norten, Joan Ockman, Spyros Papapetros, Nader Tehrani, Bernard Tschumi, Anthony Vidler, Rafael Viñoly, Mark Wigley, Marion Weiss, Eyal Weizman, and James Wines. 1600 international academics, practitioners, and scholars from 98 countries have been invited to make nominations in a new Global Survey of Architecture Books. The survey continues to expand and evolve, and will unveil volumes from many cultural contexts that contribute to a better understanding of local and global modes of knowledge production. The maps reveal the geographies of the nominators, the responses, and the books nominated. Conveying the potential for diversity of our sources of knowledge, the maps attempt to visualize the origins of the architecture books on display and of contemporary architecture culture. An online platform open to everyone, Nominate Now acts as a counterpoint to (and complements) the Global Survey of Architecture Books, which was specifically sent to established figures in the field. Nominate Now invites everyone to nominate titles they believe should be considered for inclusion in the growing library of Architecture Books. To participate, see here, or visit Storefront’s gallery space during the exhibition. A series of pop-up architecture book collections are presented at independent bookstores and cultural institutions throughout the city. Each pop-up is curated by an emerging international architect, and together, they aim to reinforce the existing network of spaces in the city dedicated to the dissemination of culture, inviting these institutions to place emphasis upon and expand their own and their visitors’ familiarity with architecture books and publications. Storefront presents a series of private salons hosted in the homes of prominent New York City-based architects. Each event, also available to the public as a podcast and transcript, explores a selection of books from the host’s personal library, open to audiences for the first time. The salons are structured as informal conversations with invited guests. Past salons have taken place in the libraries of Bernard Tschumi, Anthony Vidler, and Daniel Libeskind. For more information about upcoming salons, see here to join the New York Architecture Book Club. Storefront has partnered with the New York Public Library to offer a space in which visitors can read the books nominated as part of the Global Survey of Architecture Books. The library, as a space designed for the storage and reading of books, also offers the ability for reflection and reimagination of the volumes that occupy our centers of knowledge. The Reading Room is located in Room 300 of the Art and Architecture space at New York Public Library’s main branch on 42nd Street in Manhattan.